Last week raised the bar on the discussion of eco-thrifty renovation: ETR 2.0, if you will. That discussion included the permaculture design principles of multiple functions and redundancy. In other words, each element of a system should serve multiple functions, and each function should be fulfilled by multiple elements. Last week’s column focused on windows, and how their direction and the time of year can affect their function regarding heat loss or gain. This week I’ll use the same design principles to talk about space heating and cooking, and how a holistic, complimentary design helped us achieve a $20 power bill during the bloody cold month of June. 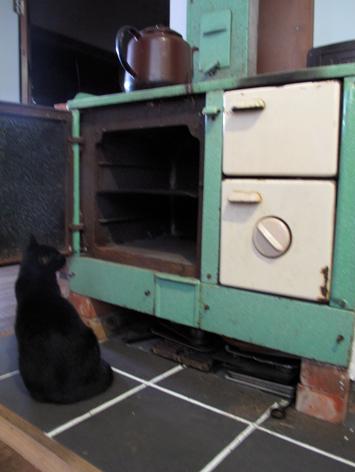 If you have been following this column, you will be familiar with our antique Shacklock 501 multi-fuel stove in the classic Kiwi-green enamel. Aside from being the centerpiece of our eco-thrifty kitchen, this 300 kg piece of iron, with an additional 400 kg of brick and concrete around, it serves multiple functions in our home. The two most obvious functions are heating and cooking. By stacking these functions on cold, cloudy days we get “double” use (multiple functions) out of the wood we burn, and save electricity because we don’t need to use the electric hob or oven. The Shacklock came in especially helpful during the power failure in March when we stoked it up for the first time and cooked soup and baked bread. But the Shacklock has another function I described briefly during one of my first columns: thermal mass. Because of the passive solar re-design of our villa – including shifting windows from south-facing to north-facing as described last week – we receive ample heat from sunlight alone on clear winter days. (This is an example of redundancy as our home can be heated by the sun or by wood.) But a critical element of passive solar design that is often overlooked is having enough thermal mass inside of the building envelope to avoid overheating. We added thermal mass in a number of ways, but the most massive mass, the Master of Mass, is the Shacklock. 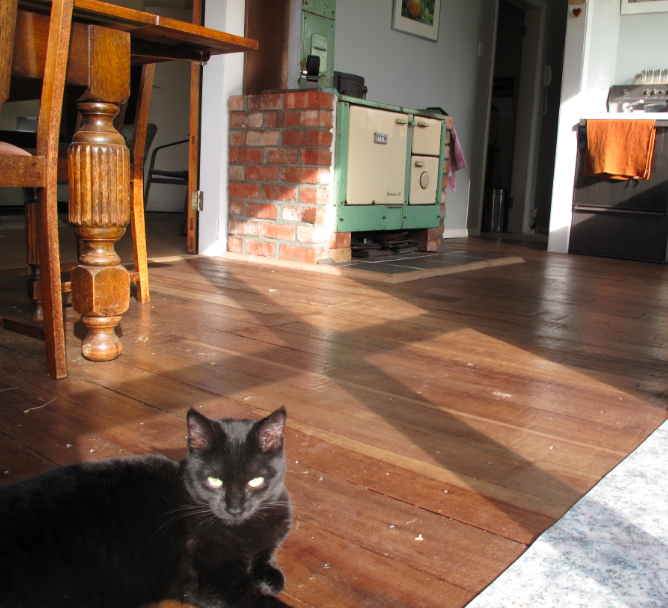 The low-angle winter sun strikes the cook stove, brick surround and concrete/tile hearth at three times of day through three different windows. Some of this heat energy is ‘stored’ in the mass until the indoor temperature drops overnight, at which point it is released into the room. This is another function that the Shacklock serves when there is no fire burning within it. As you can see, stacking functions can save resources and power, but what of redundancy? 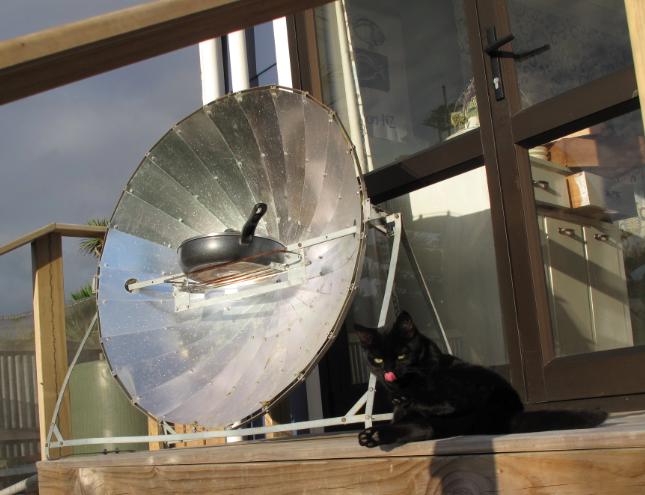 On a warm day we could cook on the electric hob, but if it is also sunny, we could use our solar cooker, even in the middle of winter. This example of redundancy exhibits an even higher level of eco-thrifty thinking (ETR 3.0?!? ): complimentary systems. In other words, whether it is sunny and cold or cloudy and cold, we can heat our home and cook our tea without electricity. If it were sunny and warm, we would probably have a BBQ or stoke up the outdoor pizza oven. If it were cloudy and warm, I would go for a surf and heat up beans and toast on the hob. They all sound like good options to me. Aside from saving power and money, designing for multiple functions, redundancy and complimentary systems is excellent practice for emergency preparedness. We do not know when the next earthquake or big blow could knock out our services, but we can be ready for when that happens while saving power and money. See, even our multiple functions can serve multiple functions.